The Happy Planner® crew has returned from their whirlwind weekend at the GO WILD Planner Conference, and is doing their best to get back to regular programming. With a goal to memory keep their experience at GO WILD, drawing inspiration from today's featured project by mambi Design Team member Katie Barton (@katietheplanner) will surely help! 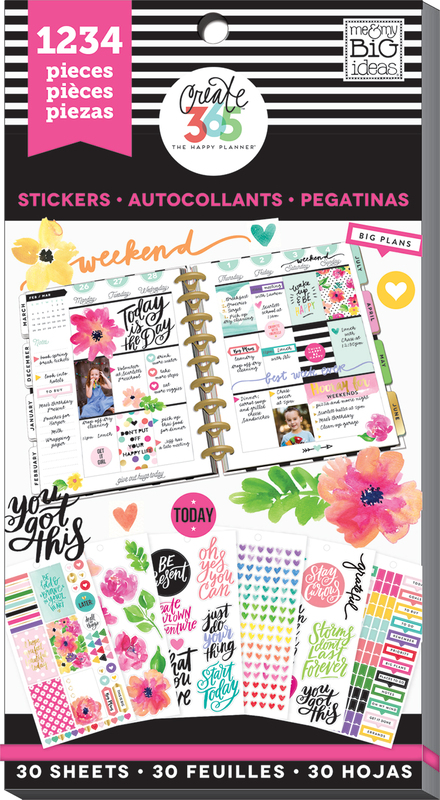 Katie dated up SPRING BREAK week in her BIG 'Get It Girl' Happy Planner®, included photos and journalling for each day, and used number stickers from our 'Alphabet' sticker value pack to mark times of events. "At first, I was really excited to add Spring Break to my memory planner, but I quickly got overwhelmed because I had a lot more photos than I normally do. I ended up picking just one or two photos from each thing we did, knowing that I could always go back later and add more photos with the Happy Planner® Pocket Pages. I tried to pick a mix of selfies and detailed shots to keep the pages interesting, while still showing a good representation of the week. "After I printed the photos I picked, I started by laying the photos on the week chronologically. I didn't have much space for decorations, so I kept it simple with number stickers to indicate the approximate time each photo was taken and just a little bit of journaling. In the notes column, I listed some of the highlights from the week and journaled about a favorite funny moment." "I had a brochure from a museum I wanted to keep with this week, but it was too thick to punch with my mambi punch. So, I taped a large POCKET PAGES™ card to the back of the brochure and punched the edge of the card. Now it snaps in perfectly, and I can still open the brochure while it's in my planner." 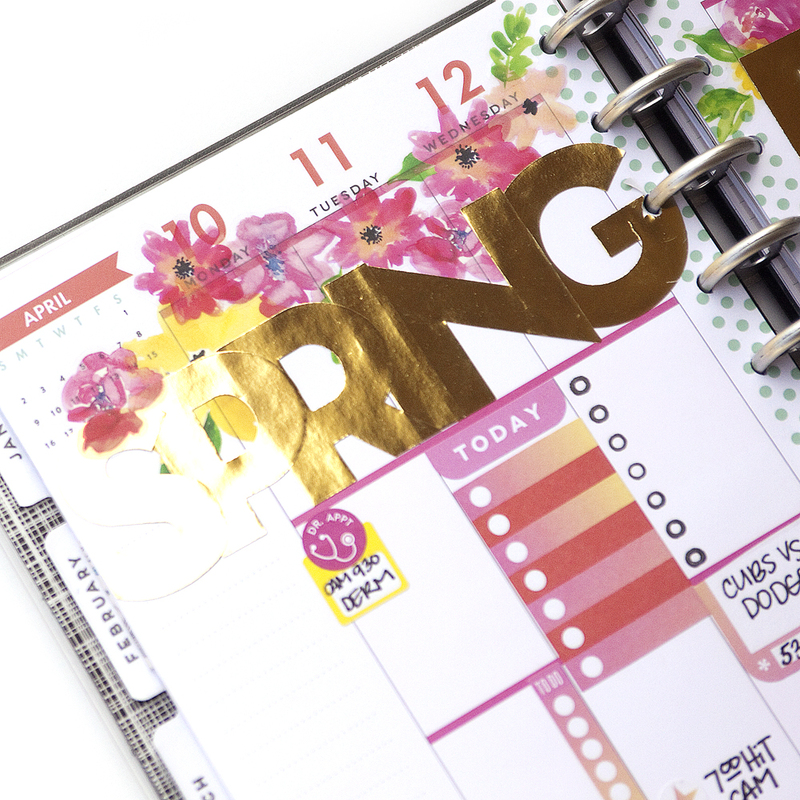 Just like Mary-Ann's April pages that we shared yesterday, our new pack of Springy floral mambiSTICKS clear stickers were the inspiration for these pages in mambi Design Team member Michelle Weissert's (IG | blog) Rose Gold Horizontal Happy Planner® at the start of this month. "I found the prettiest pack of flower stickers at Hobby Lobby a couple months ago and I was waiting for Spring to use them! They were the basis for this whole layout. I tried to do some sticky note layering and make it bright and fun to match the flowers. I even used a few flower checklists from the 'Seasonal' sticker Value Pack. They were the perfect match for this floral spread!" March, oh March, where have you gone? ...and how is it ALREADY the 20th of April? 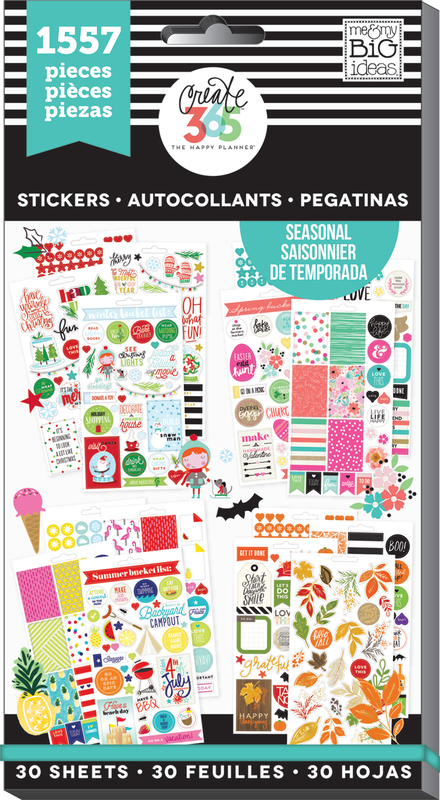 ANYWAY... All mambi Design Team member Mary-Ann Maldonado (IG | blog) can think of is 'April showers bring May flowers,' so she brought some pretty flowers into her MINI and CLASSIC April pages using some of our new mambiSTICKS stickers. "I LOVE the new mambiSTICKS sticker sheet I recently found that contains dainty flowers to coordinate with so many colorful planner spreads. They were my jumping off point for this teal & pink color theme for April." "I have started my New Year's resolutions in April (hey, it is never too late) and have taken on a new work task that I really need to keep separate and in control of. I decided I would start using my MINI planner just for that. I like the idea decorating my MINI to match my CLASSIC planner, so I intend to coordinate them, and use the same color theme and stoker sheets throughout both planners, moving forward." 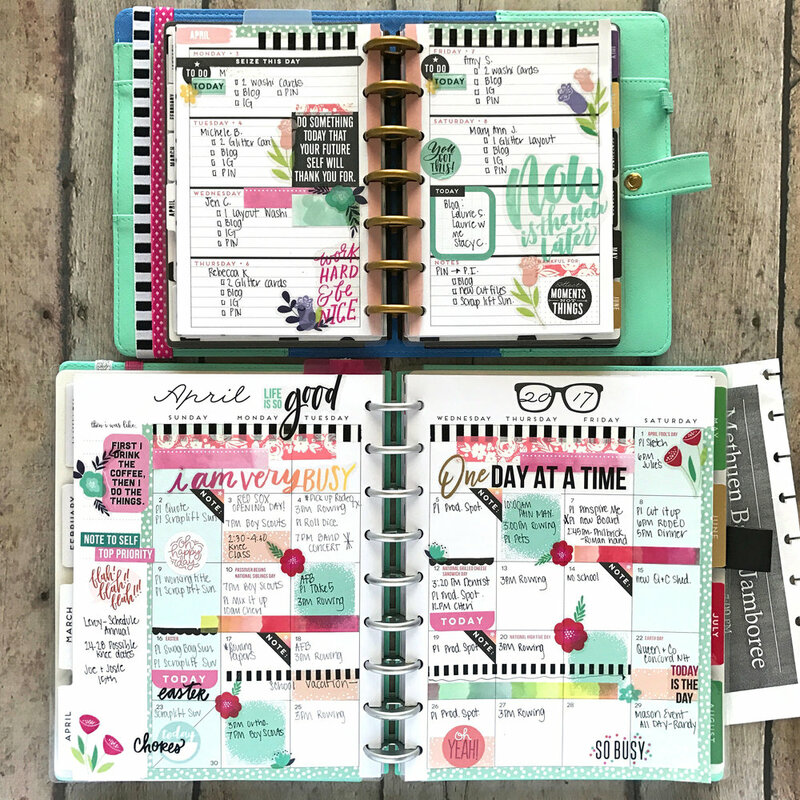 So far this year, mambi Design Team member Jen Randall (@sadieinspired) has used her BIG Happy Planner® to memory keep in. However, to switch it up for today's post - and show you how easy and unintimidating memory keeping using The Happy Planner® can be - Jen is sharing how she documented las week in her MINI 'Happy Blooms' Happy Planner®. 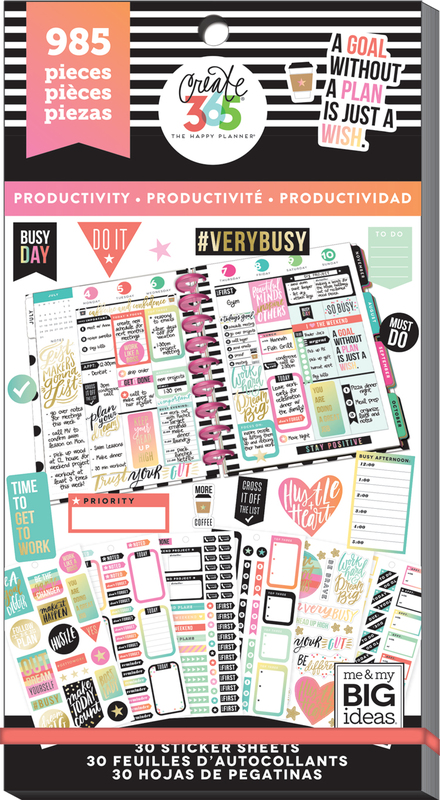 "My current obsession is memory planning in my BIG Happy Planner®. Each week I find the process of documenting our life stories relaxing and super easy in a planner. I absolutely love the size of the BIG Happy Planner®, however I thought working on a smaller scale may encourage others to give memory keeping a try." 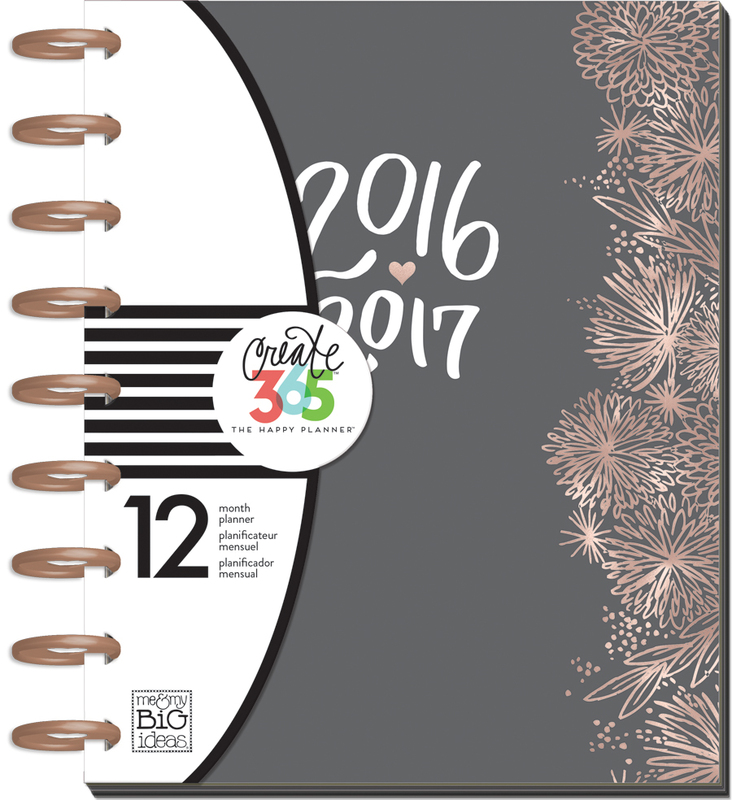 "Memory Keeping in a MINI Happy Planner® is fantastic and super fun. The size is perfect to jot down memories and it also simplifies the process even more! All I used in my 'Happy Blooms' MINI were six small (about 1.5 inches) square photos that were printed on one 4x6. I also used some stickers, washi, and one 3x4 card. I love that I can get it done each week with JUST one 4x6 and a few embellishments if I wanted to. 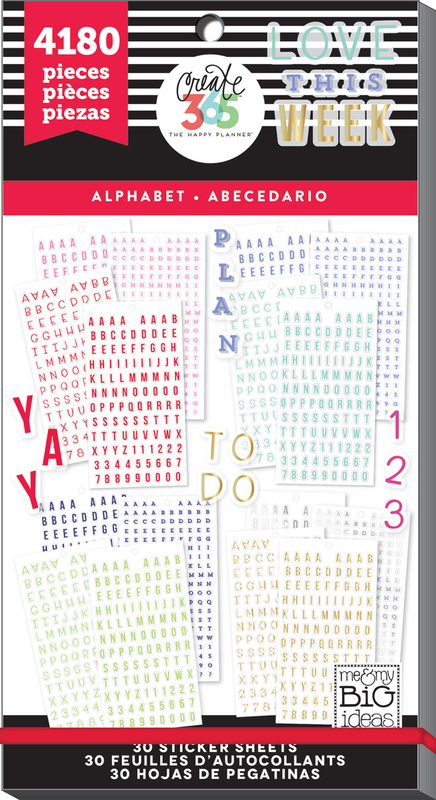 I also think this would be a perfect way for kids or teenagers to utilize all these FUN MINI Happy Planner® styles." Shop some supplies Jen used by clicking on the items below. Spring is in FULL BLOOM! ...and so are the matching pages of mambi Design Team member April Orr's (@momruncraft) CLASSIC 'Rose Gold Horizontal' and MINI 'Market Floral' Happy Planners®! 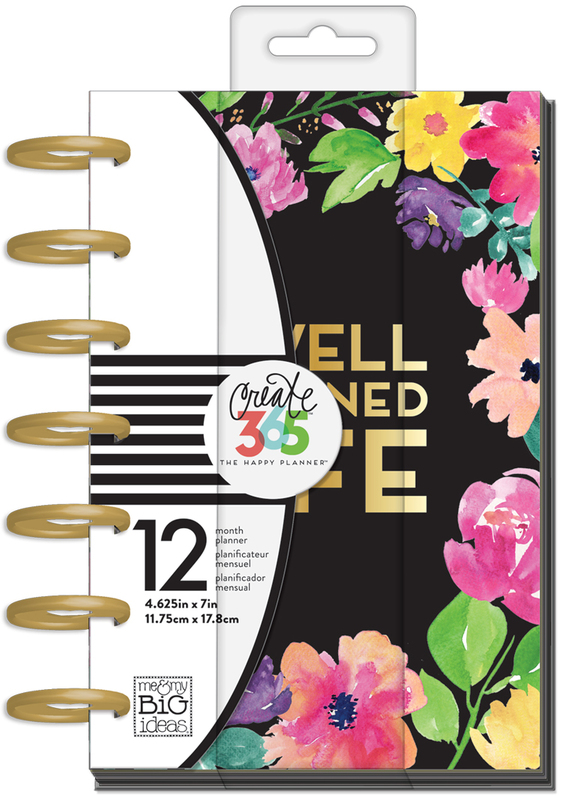 With the clear floral stickers in our 'Today is the Day' sticker value pack that come in a variety of sizes & colors, it has NEVER been easier to decorate your planner with beautiful, blooming florals perfect for this time of year! "I had fun putting together the CLASSIC-sized pages with friends on IG Live. I used the floral 'Today is the Day' sticker value pack which is one of my all time favorites! I love to cut the flowers in half before I stick them to the page and layer - as the flowers look as though they are dancing onto the page. I wanted to use the same color scheme and stickers for the corresponding mini pages for those who may have planner MINI and CLASSIC twins. For the mini, I used pages from the new undated, floral planner. I used a pencil to divide the horizontal space in half, and then numbered long and lean." Shop some supplies April used by clicking on the items below. The end of this week brings with it the Easter holiday, and mambi Design Team member Nita Patterson (@neatlyplanned) prepped this week in her CLASSIC 'Be Bright' Happy Planner® with festive mambiSTICKS stickers and florals bursting * SPRING * from her pages! "Easter was one of my favorite holidays growing up. I looked forward to dying eggs and Easter baskets. I wanted to create a spread using the Easter mambiSTICKS and the 'Today is the Day' sticker value pack that reflected those childhood memories." "I used The Happy Planner® washi tape for color inspiration and decided to coordinate the eggs and boxes to add depth to my spread. This layout is full of embellishments but still can be functional. When planning, I love to add details and some elements that will draw my attention to a specific day or event. I used this sticker technique from fellow Design Team member April Orr to cut the floral stickers in half to create the illusion they are growing off the page. I also used this technique with small circle flower stickers to create half-bullets." Shop some supplies Nita used by clicking on the times below. Yesterday was the first day of Spring, and we are excited to move into this warmer time of year and the spring-themed pages of the 'Seasonal' sticker value pack! Design Team member Gretchen Klobucar (IG | blog) used the 'Spring bucket list' page to create this visual list for her MINI Happy Planner®, and created the cutest little kite out of a full block pattern sticker! "This year winter is like that one guest who just won't leave your house when the night is ending...and with gloomy gray skies and blustery winds, I needed a pick me up to look forward to. I decided to plan out my Spring Bucket List using a MINI Happy Planner® note sheet and the 'Seasonal' sticker value pack." "My favorite part of this was doodling the kite! I trimmed down a full-box sticker into a diamond shape. Then I cut a flower ToDo list sticker in half lengthwise, and trimmed it as the horizontal cross bar for the kite. I added a coordinating asterisk at the bottom and drew in the kite's tail. I will definitely be making more kites in my weekly spreads!" Today we're coming at you with a fun DIY project by mambi Design Team member Laura Rahel Crosby (blog | IG) that would work to decorate a garden, desk, or window sill, or be the perfect craft for kids. 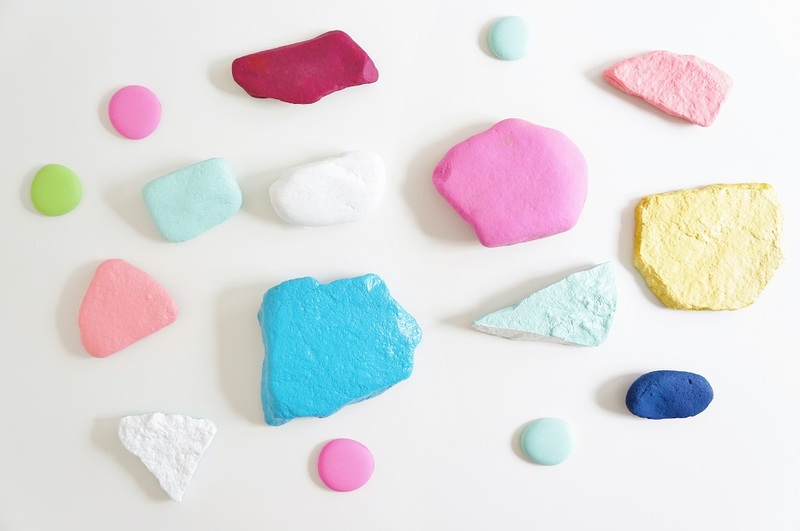 These statement rocks using some of our clear mambiSTICKS stickers would work as a gift for your child's new teacher at the start of the school year paired with a handmade card. "These beauties are colorful and oh so delightful to look at. I have a small vegetable garden this year and to help attract more bees to my tomato plants (to increase their health and fruitfulness) I wanted to add some color around all the green plants in my garden. Mission totally accomplished with these gorgeous colorful rocks that now line my garden. For this DIY you need some rocks, (rocks with a flat/smooth face work best) acrylic paint in your favorite colors, and mambiSTICKS clear sticker packs. I love finding a new way to use my beautiful supplies and these stickers look even more fun on rocks than they did in my scrapbook. YAY for trying new things!" "Paint your rocks with a few layers of acrylic paint, letting each layer of paint dry before reapplying. If you're going to use your rocks outside, you can seal them with a clear coat but acrylic paint is waterproof so it's not necessary unless you want that extra layer of protection. Next, pick your favorite phrase stickers from the mambiSTICKS sticker pack and add them to your rocks. Then you're done! I told ya it was easy! This project is probably one of my all time favorite DIYs I've ever created. The rocks are so bright, fun, and colorful. I put most of them out in my garden and I kept my favorite one inside to use as a decoration/ paperweight on my desk."